Many of you will soon be making the trip to San Diego for the 2018 Esri User Conference. The Story Maps Team will be at the UC Expo to meet with you and we will also be presenting many sessions and workshops, and we’re excited to meet with our growing and thriving community of story map authors and developers. This blog has info about the types of activities the Story Maps Team will be involved in at the conference. You can also check out the detailed conference agenda on the web or in the Esri Events app for details, or you can download our handy Story Maps UC schedule flier (see link, below). And be sure to follow us on Twitter for Story Maps updates at the conference and all year long. One more thing—be on the look out for the announcement of the winners of the Esri 2018 Storytelling With Maps Contest, which will be revealed during the UC. We’ll post a link to the winners on the Story Maps website when they are announced. The UC Expo is the place to go to get your questions answered. Our team will be available to chat with you one-on-one and we’ve also got presentations scheduled all day in the Story Maps Expo Spotlight Theater. These short, 15-minute talks are perfect for getting quick tips on specific topics such as using charts in story maps, improving accessibility, or promoting your stories on social media. 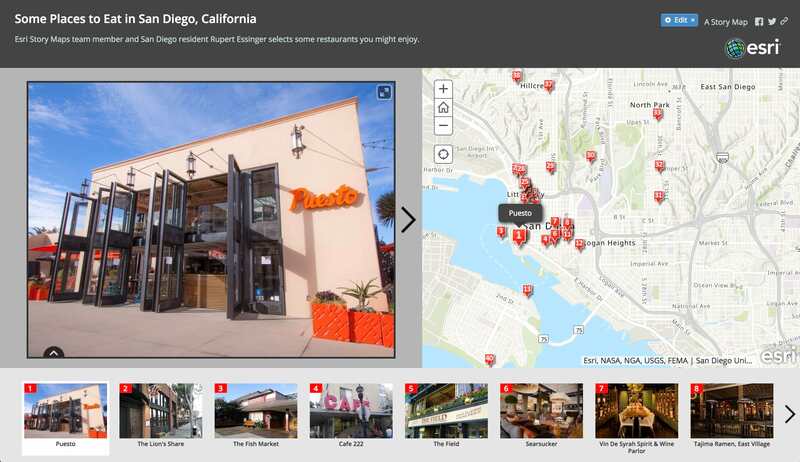 Intro to Story Maps: a short introductory session in case you’re not ready to commit to one of the hour-long tech workshop sessions. 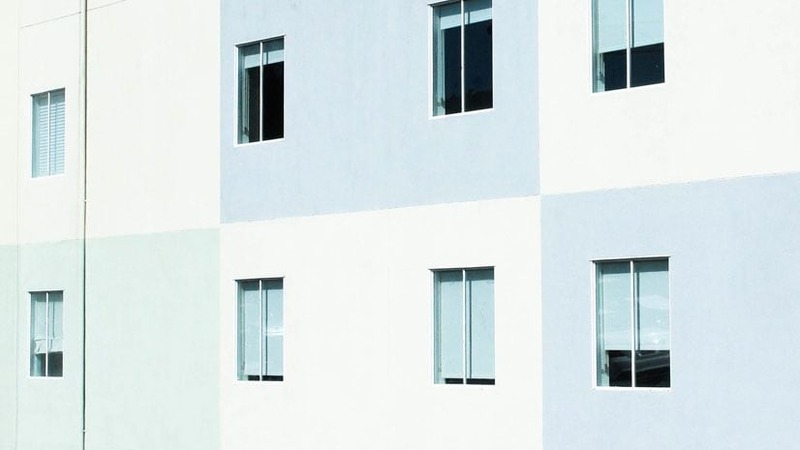 Stories behind our Stories: Our team of storytellers will give you insight into their process and lessons learned while creating some of the amazing stories they’ve published over the last year. Each one of these sessions will highlight a different story, so feel free to attend more than one. There’s also an hour-long tech workshop version of this session that will cover all of the material from the Spotlight Theater talks. Check the agenda or our flier for times and details about these presentations. We’re also offering the usual compliment of technical workshops and demo theater presentations. Technical workshops are 1-hour sessions in which the presenters have time to cover a topic in detail. 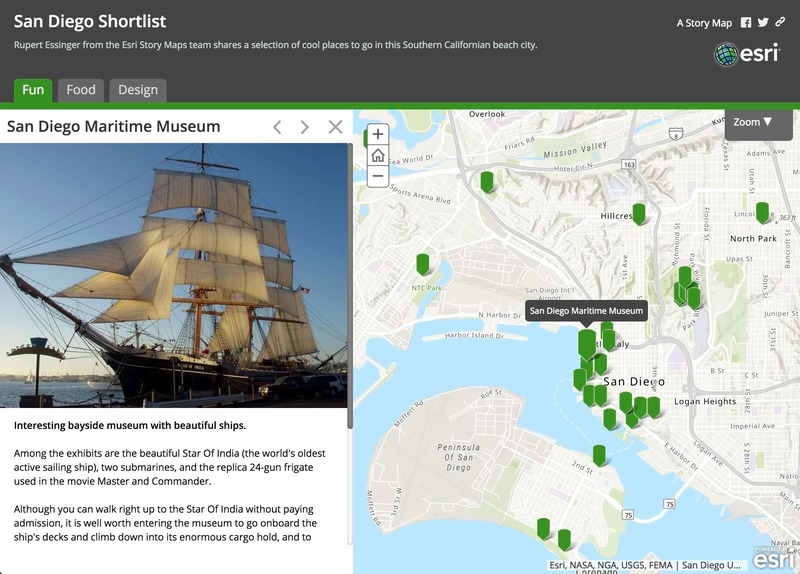 There are several workshops for beginners where you can learn what story map templates are available and how they can be used to help your organization create engaging and informative stories using the power of maps. More experienced story map authors will also find workshops filled with new tips and techniques from other authors that will help elevate your stories. 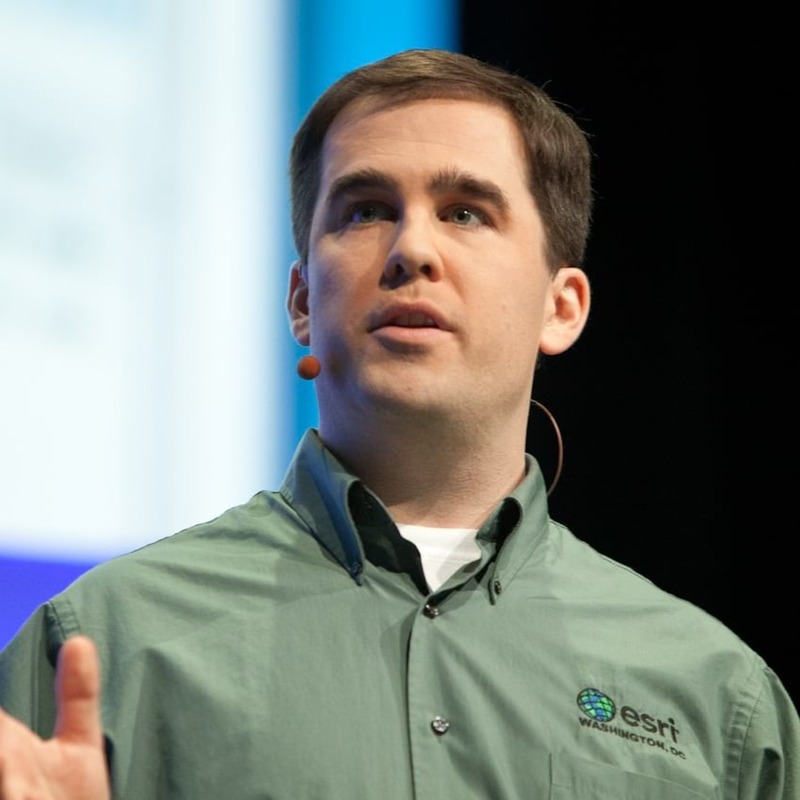 Demo theaters are 30 minutes (plus some time for Q&A) and designed to get you up to speed on how to use specific Esri Story Map templates. As usual, the demo theaters are located around the outside of the Expo hall. Again, check the agenda or our flier for times and details. 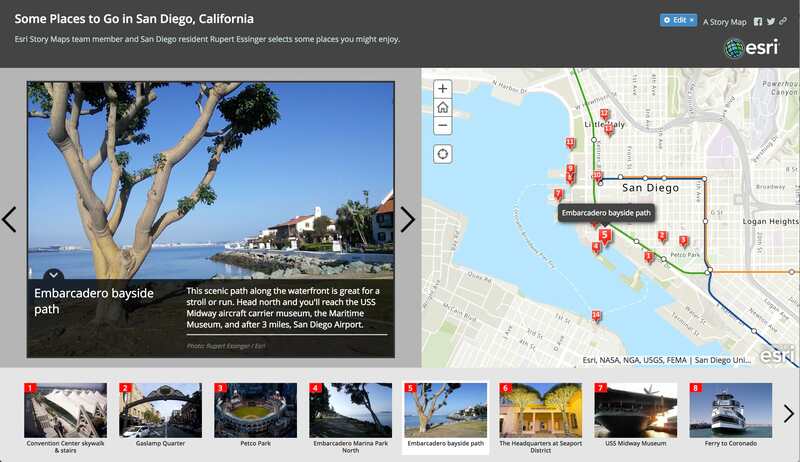 The Story Maps Team’s own Rupert Essinger lives in San Diego and has created several story maps to help you find interesting activities and places to go while you’re in town. 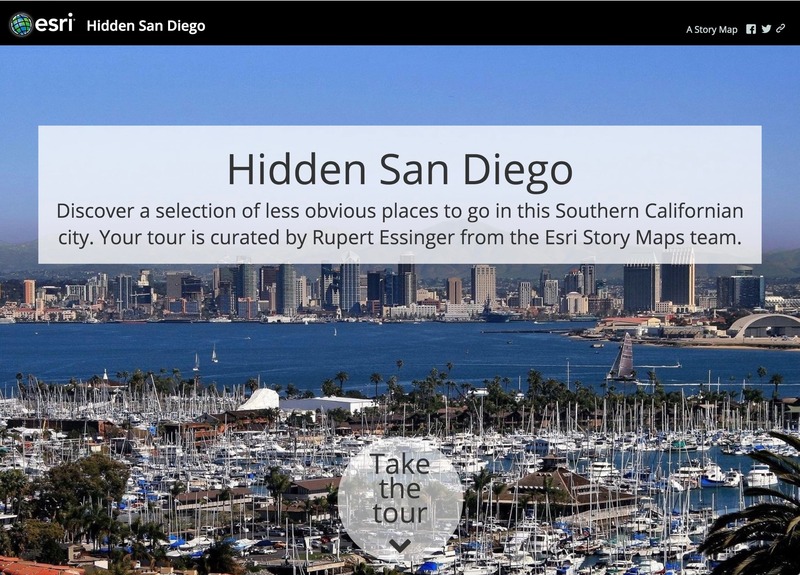 Check out the stories below to learn more about the fantastic city that hosts the Esri UC.